Labor Day Weekend is right around the corner and if you don't know what to do for more store and business traffic during the Labor Day weekend give our discounted outdoor advertising products a try! 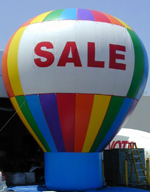 Attract passer byers and potential customers that are miles or blocks away to your store by using our Sky Puppets, Feather Flags, Searchlights and Custom Inflatables. Our famous Outdoor Advertising products sets your business apart! Let us help you get your business noticed! We know you are on a small advertising budget and with our every day low prices we have discounted them even more allowing you to you maximize your traffic and advertising ROI. Draw attention to your business and increase sales and stand out over the competition this Labor Day Weekend! Need visibility this upcoming Labor Day Weekend? 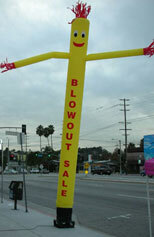 Our Sky Puppet Blowers are state-of-the-art machines used for a number of outdoor advertising. Our blowers are powerful and versatile 1 HP motor 750 Watts, and designed specifically for use with Sky Puppets. Our blowers are more powerful than standard 3/4 HP blowers and include locking wheels and handles on both sides for easy transporting. Get a new Sky Puppet Blower today. Get your store noticed with our banner feather flags which includes a pole with a combined height of 15 feet tall and 2 feet wide flapping in the wind. The flag image is 100% dyed-through, single-sided (back side reverse) with a "stay open" design lets your customers read the banner even when the wind is not blowing. The fabric material is knit polyester for long life and bright colors. Be seen and store traffic with a Feather Flags today. Night time traffic is easy by projecting a powerful beam of light to showcase your special events, grand openings, galas, product promotions, advertising, promotional sales, parties, and concerts, etc. Use our outdoor advertising Search Lights to attract attention to your event. © 2006-2009 SkyPuppet.com Owned and operated by Nationwide Access, LLC. All rights reserved.